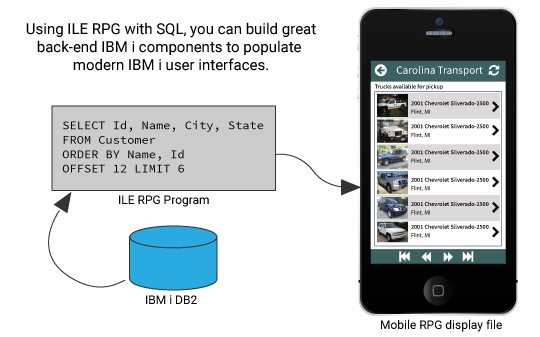 ILE RPG and SQL make a great team for building mobile back-end components. Our free Webcast shows you how your RPG/SQL knowledge can be put to work building IBM i mobile apps. IBM has done a great job improving SQL on the IBM i over the years. A while back the LIMIT and OFFSET SQL keywords were added. These keywords make it easy to "page" through data. This Webcast shows how we use this kind of SQL on the IBM i to create great RPG backends for Mobile, Windows, and Web applications. During the Webcast we'll also take a look at how effective the IBM i data paging possibilities are when filters are in place. For example, let's say you only want to page through customers who live in California. This type of behavior is snap to implement--and it performs very well. Free format ILE RPG makes a great partner with SQL on the IBM i so we'll also take a look at that in this Webcast. If you're not using full free-format RPG, you're missing a great thing! To tie the whole Webcast together, we'll show the resulting RPG and SQL are used in an ASNA Mobile RPG application. Achieve tangible business ROI quickly. RPG programming skills are all that's needed to create great mobile apps quickly. Redefine business workflows for today's mobile workforce. IBM i mobile apps redefine the ways we use the IBM i. Integrate IBM i business data with mobile naturally with RPG. Secure, performant IBM i read/write database access included. Integrate mobile features (maps, charts, images, geo location) easily. Mobile user interface elements are surfaced in a clever way to make them easily accessible to RPG programmers. Target smartphones or tablets. ASNA Mobile RPG works with Android, Apple, and Windows 8 phones and tablets. HTML5 or hybrid apps. HTML5 apps leverage the reach of the browser while hybrid apps better expose some native hardware features (signature capture, for example). Many IBM i clients are capitalizing on the opportunity to interface directly to mobile devices and they are updating applications to be rendered on devices such as mobile phones and tablets. Don't let your competitors beat you to mobile! © 2017 by ASNA. All rights reserved.